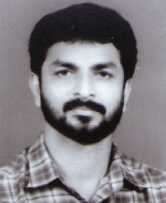 Kottakkal Madhu was born on Oct 26, 1968. His father is K. Govindan Nair and mother is K. Sathyabhama. Along with his school education he learned Karnatic Music from Parameswara Iyar. After passing 6th, he joined P.S.V. Natyasangham on 1980 and learned Kathakali Music. Has practiced Kathakali Music under Kalamandalam Neelakandhan Nambisan, Kalamandalam Unnikrishna Kurup, Kottakkal Gopala Pisharody, Kottakkal Parameswaran Namboothiri and Kottakkal Narayanan and Karnatic Music under Madhavav Nair. Now working in P.S.V. Natyasangham, Kottakkal. At the time of his studies has won the prize in Mundaya Venkitakrishna Bhagavathar Kathakali Music Contest, has received 'Ponnada' from his Karnatic Music Teacher itself, etc. Has participated Kathakali Performance all around Kerala and India and in Switzerland with P.S.V. Natyasangham Kathakali Troup. Family: Wife Vrinda and one daughter Krishnendu.